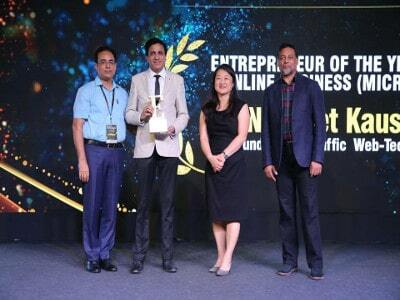 PageTraffic has won the Entrepreneur Of The Year - Online Business (Micro) Award For The Year 2018 at 8th Annual Entrepreneur India Awards organized by Entrepreneur magazine (US-based, Entrepreneur Magazine) in association with Franchise India and in media partnership with Zee Business. Expressing his gratitude, the CEO at PageTraffic, Mr. Navneet Kaushal stated, "we express our gratitude on being bestowed with the award. Over the last few years, we have won numerous awards for our work in the SEO industry, and we will surely set new benchmarks in the years to come. Backed by our team of experts, experience, resources, and research, we are well acquainted with what's new in SEO. This enables us to help businesses stand out, helping them reach their business goals''. we express our gratitude on being bestowed with the award. Over the last few years, we have won numerous awards for our work in the SEO industry, and we will surely set new benchmarks in the years to come. Backed by our team of experts, experience, resources, and research, we are well acquainted with what's new in SEO. This enables us to help businesses stand out, helping them reach their business goals.